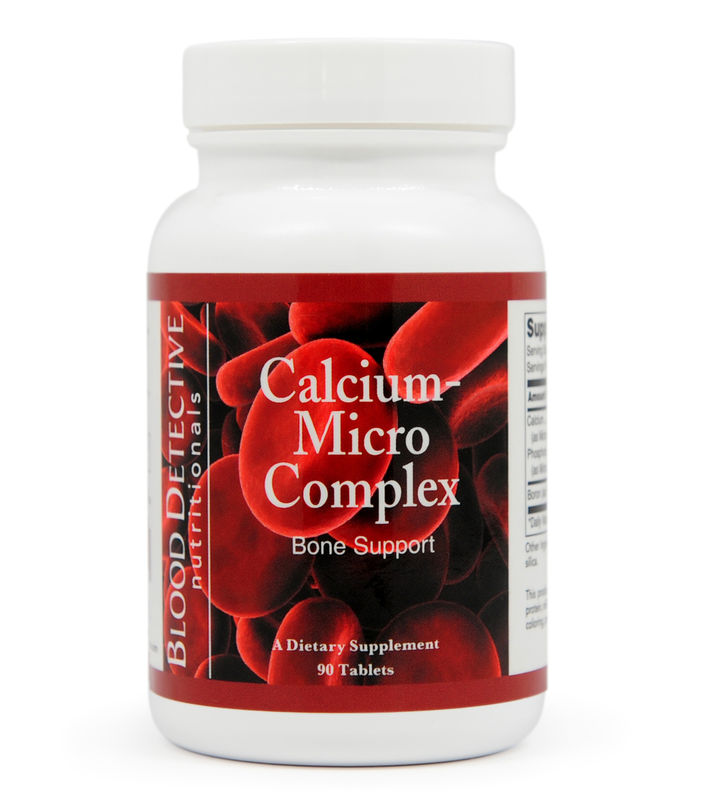 Calcium-Micro Complex Bone Support, provided by Blood Detective™ Nutritionals, 690 mg of Calcium (dicalcium phosphate/citrate/hydroxyapatite), a bioavailable source of calcium. The adult human body contains approximately 1,200 g of calcium, about 99% of which is present in the skeleton. Bone is constantly turning over, a continuous process of formation and resorption. In children and adolescents, the rate of formation of bone mineral predominates over the rate of resorption. In later life, resorption predominates over formation. Therefore, in normal aging, there is a gradual loss of bone. osteoporosis. Among other factors, such as regular exercise, gender and race, calcium supplementation during childhood and adolescence appears to be a prerequisite for maintaining adequate bone density later in life. But even elderly osteoporotic patients can benefit signifi cantly from supplementation with dietary calcium. Calcium (dicalcium phosphate/citrate/hydroxyapatite) provides a highly beneficial source of dietary calcium together with other nutrients that assist in the maintenance of healthy bone structure and function. For example, boron affects the composition, structure, and strength of bone. It appears to be necessary for calcium and magnesium absorption, their adequate renal reabsorption, and their incorporation into the bone matrix. Boron is absorbed at about 90% effi ciency and is rapidly distributed among the tissues. Calcium-Micro Complex (Bone Support), provided tablets may be a useful dietary supplement for individuals who wish to increase their intake of calcium and other nutritional factors for the maintaining of healthy bone function. Adults take 3 tablets daily with meals or as directed by a physician.